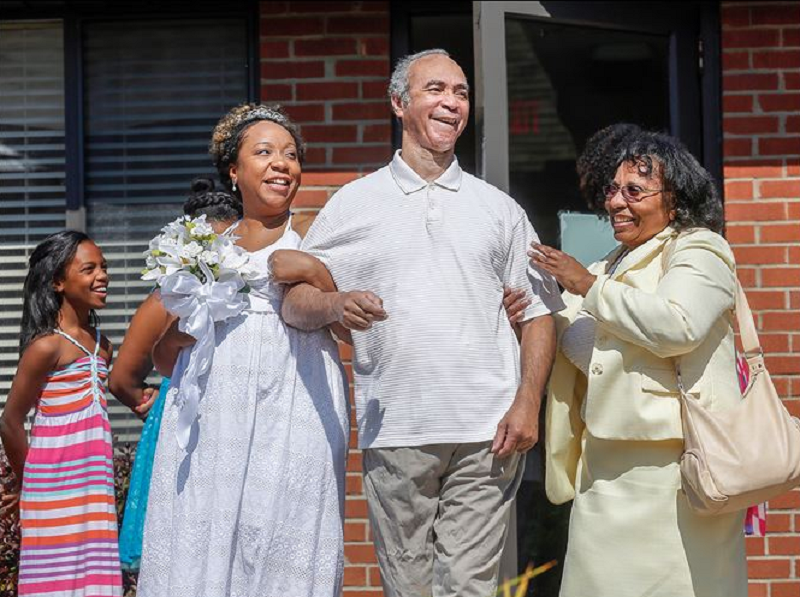 Although Miriam Davis had wanted a traditional wedding at her church, she decided to move the ceremony to a nursing home in Ohio so that her father would be able to walk her down the aisle. Miriam’s 64-year-old father, Bernard Reeves, has advanced-stage Alzheimer’s disease, and currently lives at the Foundation Park Alzheimer’s Care Center in Toledo, Ohio. And that is why Miriam decided to marry her husband, Mark Davis, at the care center. Before coming up with the idea to take her wedding to her father, Miriam and Mark were planning on getting married at their church in Ypsilanti, Michigan. However, Miriam was afraid that her father might wander away from the ceremony and get lost. Reeves was first diagnosed with Alzheimer’s in 2006, and moved in the Toledo nursing home in 2008 after his condtions worsened. Prior to being diagnosed with Alzheimer’s disease, Reeves was a pastor at the New Creation Church in Detroit. He is also a Vietnam War veteran, and was stationed in Germany during the war. The wedding ceremony held at his nursing home only had an audience of around 30 people, but Davis was overjoyed to have her father walk her down the aisle as the guests struggled to hold back tears. “He still knows who we are, but he doesn’t say much and he can’t care for himself. I feel like a part of him will know what’s going on,” his daughter said before the ceremony. After the ceremony was finished, the bride and groom wanted to invite the wedding party out to dinner somewhere in Toledo.